However, the continued dramatic rise in ASD prevalence and autism’s heavy burden on individuals, families, schools and wider society call for a far greater sense of urgency. Autism must be recognized as a national crisis. As of this writing (April 2018), the CDC is due to release its latest ADDM surveillance numbers. 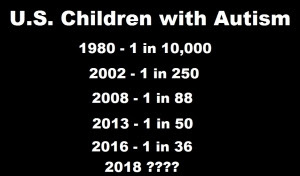 Will our federal health agencies continue to downplay the numbers’ significance, as they have done each time the data show a rise in ASD prevalence? Or will they finally sound an alarm and make it a top priority to find out what is causing this epidemic in our children? No one—and not least the agencies that are supposed to be looking out for children’s best interests—can afford to be complacent any longer about this unjustifiably neglected public health emergency.